Seneffe, Belgium, April 19, 2018. Tomorrow, Eckert & Ziegler BEBIG will be proud to welcome Wolf-Medizintechnik GmbH (WOmed) at booth 900 for ESTRO 37 in Barcelona, Spain. The company, based in St. Gangloff, Germany, will present its well-established product portfolio, including its newest system for the efficient application of superficial and intraoperative x-ray therapy, the ioRT-50. This will be the first time since the acquisition of WOmed in December 2017 that the two companies will exhibit together. "We are looking forward to introducing the WOmed product portfolio to our customers and vice versa", says Dr. Harald Hasselmann, Managing Director of Eckert & Ziegler BEBIG and Member of the Board of Directors of Eckert & Ziegler AG. "In recent years, Eckert & Ziegler BEBIG has continuously expanded its portfolio with new radiation therapy products via acquisitions and partnerships, to offer our customers broader treatment options. We will continue with this strategy to further establish Eckert & Ziegler BEBIG, not only as a leader in brachytherapy, but also as a partner in radiation therapy." WOmed, was founded in 1990 and, since 1994, the company has been based in St. Gangloff, Germany. Today, the company's scope is the development, production and maintenance of systems for superficial and orthovoltage x-ray therapy. 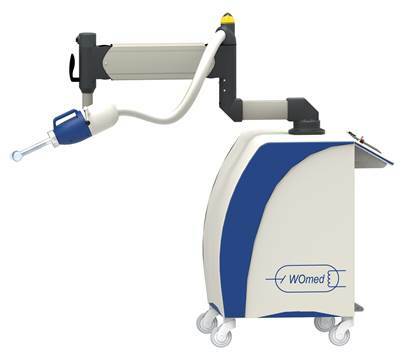 WOmed customers can draw upon many years of experience of staff and partners, who offer services to the entire specific field of x-ray technology. Eckert & Ziegler BEBIG signed an agreement to acquire WOLF-Medizintechnik GmbH on December 19, 2017. With this forward-looking partnership, WOmed combines the certainty of further long-term continuity for the benefit of customers and their patients. Eckert & Ziegler BEBIG is a European-based group active in the medical device segment of the healthcare industry. Its core business is the production and distribution of medical products for the treat­ment of cancer, using brachytherapy. The company's headquarters are in Belgium, with production facilities in Germany and the USA, as well as subsidiaries throughout Europe, the USA, India and Brazil. In addition, Eckert & Ziegler BEBIG has a worldwide network of distributors and agents to support the international marketing and distribution of its product line. The company's products and equipment are intended for use by oncologists, radiotherapists, urologists, ophthalmologists and medical physicists. Eckert & Ziegler BEBIG employs approximately 145 people. The company has been listed on the Euronext stock exchange since April 1997.